Heavy duty kingpinless caster formed with hot forged ASTM1045 Steel, eliminating problems associated with kingpin failure due to severe shock loading. Zinc plated casters feature integrally forged top plate and inner raceway. Precision machined and induction hardened sealed raceway provides exceptionally smooth performance. 3/8" diameter HRC 45 steel ball bearings absorb thrust and load in severe environments. For ease of maintenance, a grease fitting is located in swivel raceway. Applications: Wherever severe shock loads are anticipated. 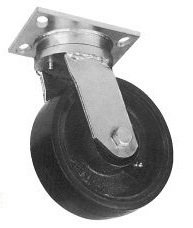 Choose the appropriate wheel bearing for your kingpinless swivel caster depending on desired use and requirements. Rubber on Steel 300 NCC-KP35S420-RSR 6.16 "
Rubber on Aluminum 400 NCC-KP35S420-RAR 5.06 "
4" 2 Rubber on Polyolefin 450 NCC-KP35S420-TPRR 3.96 "
Polyurethane on Polyolefin 700 NCC-KP35S420-PPUR 3.96 "
Polyurethane on Steel 700 NCC-KP35S420-PUR 6.16 "
Solid Polyurethane 700 NCC-KP35S420-SPUR 3.96 "
Polyurethane on Aluminum 700 NCC-KP35S420-PAR 5.06 "
Semi Steel 700 NCC-KP35S420-SSR 5.72 "
Heavy Duty Steel 900 NCC-KP35S420-SSR-HD 6.72 "
Donut Tread Polyurethane 600 NCC-KP35S420-DPRR 3.96 "
Nylon 500 NCC-KP35S420-NR 3.96 "
4" 2 Ductile Steel 1500 NCC-KP35S420-DSR 7.51 "
EZ Rolling Ductile Steel 1500 NCC-KP35S420-CDSR 7.05 "
V Groove 1000 NCC-KP35S420-VGR 6.71 "
Polyolefin 450 NCC-KP35S420-POR 5.06 "
Phenolic 800 NCC-KP35S420-PHR 5.25 "
High Temp Phenolic 800 NCC-KP35S420-PHR-HT 5.25 "
Rubber on Aluminum 500 NCC-KP35S520-RAR 5.75 "
Rubber on Polyolefin 500 NCC-KP35S520-TPRR 4.62 "
Polyurethane on Polyolefin 750 NCC-KP35S520-PPUR 4.62 "
Polyurethane on Steel 1200 NCC-KP35S520-PUR 6.60 "
Solid Polyurethane 1000 NCC-KP35S520-SPUR 4.62 "
Polyurethane on Aluminum 900 NCC-KP35S520-PAR 5.28 "
EZ Rolling Polyurethane on Steel 1000 NCC-KP35S520-EZPUR 7.01 "
5" 2 Semi Steel 1000 6-1/2 NCC-KP35S520-SSR 7.92 "
Heavy Duty Steel 1000 NCC-KP35S520-SSR-HD 9.01 "
Donut Tread Polyurethane 900 NCC-KP35S520-DPRR 5.91 "
Ductile Steel 1500 NCC-KP35S520-DSR 9.25 "
EZ Rolling Ductile Steel 1500 NCC-KP35S520-CDSR 9.01 "
V Groove 1100 NCC-KP35S520-VGR 8.58 "
Polyolefin 650 NCC-KP35S520-POR 4.62 "
Phenolic 1000 NCC-KP35S520-PHR 5.75 "
High Temp Phenolic 1000 NCC-KP35S520PHR-HT 5.75 "
Rubber on Steel 500 NCC-KP35S620-RSR 7.71 "
Rubber on Aluminum 550 NCC-KP35S620-RAR 6.61 "
Rubber on Polyolefin 550 NCC-KP35S620-TPRR 5.06 "
Polyurethane on Polyolefin 900 NCC-KP35S620-PPUR 5.06 "
Polyurethane on Steel 1200 NCC-KP35S620-PUR 8.58 "
Solid Polyurethane 1200 NCC-KP35S620-SPUR 5.06 "
Polyurethane on Aluminum 1000 NCC-KP35S620-PAR 6.01 "
EZ Rolling Polyurethane on Steel 1200 NCC-KP35S620-EZPUR 9.01 "
Semi Steel 1100 NCC-KP35S620-SSR 8.58 "
6" 2 Heavy Duty Steel 1200 7-1/2 NCC-KP35S620-SSR-HD 9.61 "
Ductile Steel 1500 NCC-KP35S620-DSR 9.61 "
Donut Tread Polyurethane 1000 NCC-KP35S620-DPRR 5.91 "
Gray Donut Rubber on Aluminum 420 NCC-KP35S620-RAR-GD 6.41 "
Gray Donut Rubber on Steel 420 NCC-KP35S620-RSR-GD 6.91 "
EZ Rolling Ductile Steel 2000 NCC-KP35S620-CDSR 6.91 "
V Groove 1200 NCC-KP35S620-VGR 10.12 "
Polyolefin 750 NCC-KP35S620-POR 5.06 "
Phenolic 1200 NCC-KP35S620-PHR 7.51 "
High Temp Phenolic 1200 NCC-KP35S620-PHR-HT 7.51 "
Rubber on Steel 500 NCC-KP35S820-RSR 9.68 "
Rubber on Aluminum 550 NCC-KP35S820-RAR 7.51 "
Rubber on Polyolefin 550 NCC-KP35S820-TPRR 5.51 "
Polyurethane on Polyolefin 900 NCC-KP35S820-PPUR 5.51 "
Polyurethane on Steel 1200 NCC-KP35S820-PUR 12.11 "
Solid Polyurethane 1400 NCC-KP35S820-SPUR 5.51 "
Polyurethane on Aluminum 1000 NCC-KP35S820-PAR 5.51 "
EZ Rolling Polyurethane on Steel 1500 NCC-KP35S820-EZPUR 13.11 "
8" 2 Semi Steel 1200 9-1/2 NCC-KP35S820-SSR 13.11 "
Heavy Duty Steel 1200 NCC-KP35S820-SSR-HD 13.11 "
Ductile Steel 2000 10-1/8 NCC-KP35S820-DSR 13.11 "
Donut Tread Polyurethane 1200 NCC-KP35S820-DPRR 5.91 "
Gray Donut Rubber on Aluminum 500 NCC-KP35S820-RAR-GD 6.41 "
Gray Donut Rubber on Steel 500 NCC-KP35S820-RSR-GD 6.91 "
EZ Rolling Ductile Steel 2000 NCC-KP35S820-CDSR 13.11 "
V Groove 1200 NCC-KP35S820-VGR 14.74 "
Polyolefin 1000 NCC-KP35S820-POR 5.51 "
Phenolic 1400 NCC-KP35S820-PHR 7.75 "
High Temp Phenolic 1400 NCC-KP35S820-PHR-HT 7.75 "